Outdoor plants indoors |Sundews Etc. My outdoor growing areas are a real mess. I haven't had the heart to document it all yet (although that's coming soon), but I lost a lot of Sarracenia and other things last year to bad weather and poor planning. I'm working on making my outdoor growing space nicer, but in the mean time indoor growing seems to be just the thing. I've got a few outdoor plants growing indoors under lights for the time being, until I can get my stuff arranged better. 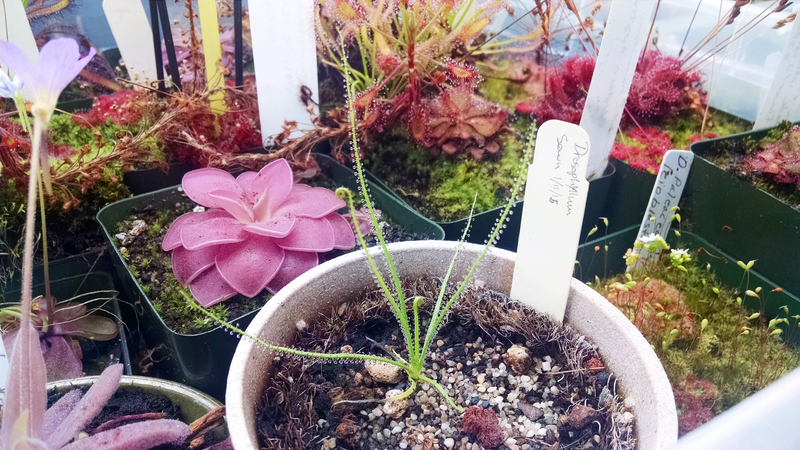 This Drosophyllum lusitanicum from my friend Anne is still small enough that it fits in the tray. I love when these get big. Fingers crossed! D. lusitanicum smells of honey! It's really lovely. I hope to have a nice big bush eventually. I'll need to pot it up before then though. 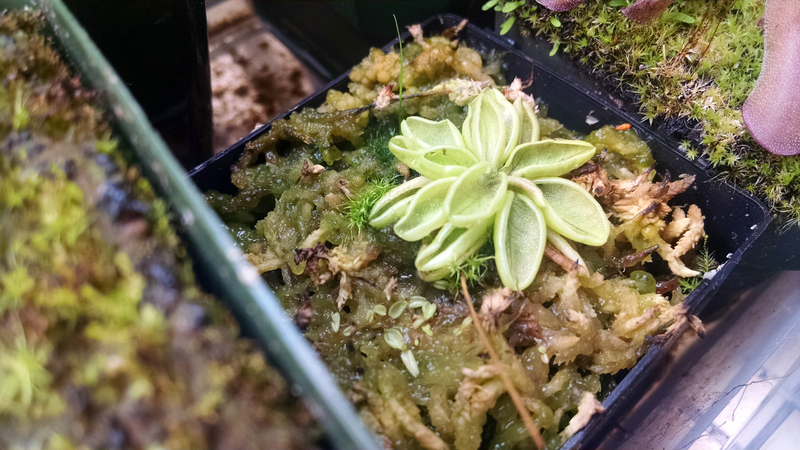 Pinguicula lusitanica seems to be doing fine. Not sure pure LFS is the best mix for these guys. Those little babies look very funny. This is a very annual species. I collected some seed last time – I should sow those on another pot. This would be a great component of an outdoor mixed bog. 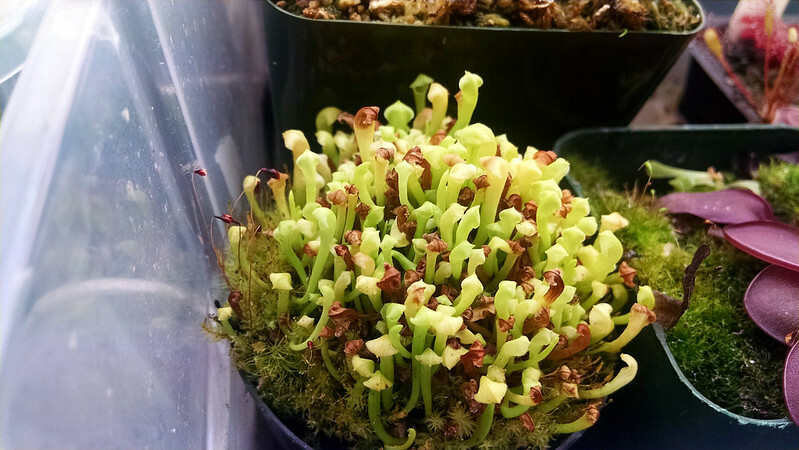 It's about time to pot up the antho-free Sarracenia leucophylla seedlings that Anne and I went in on together last year. I wonder if I'll get mature pitchers this year with a fresh pot-up. It's a bit hard to tell, but these have put on some size in the last year. I bet if we were to give them room they could get some serious growth on. That would be great! 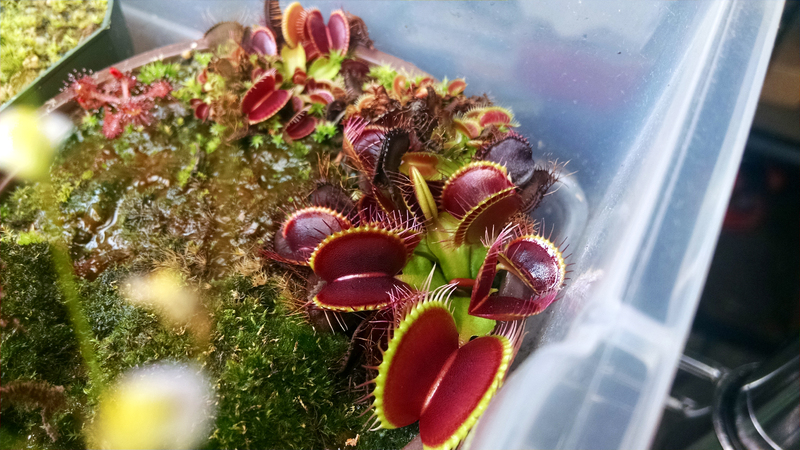 My Dionaea 'B-52' leaf pulls are looking really fantastic. I'm not much of a flytrap guy, but this is a show-stopper. I lost the mother plant, so I'm really glad I have these. Once my outdoor growing area gets settled in I'll take these out there and give them individual pots. This is a truly superior clone. Look at the contrast in color in the foremost trap! Total swoon over here. 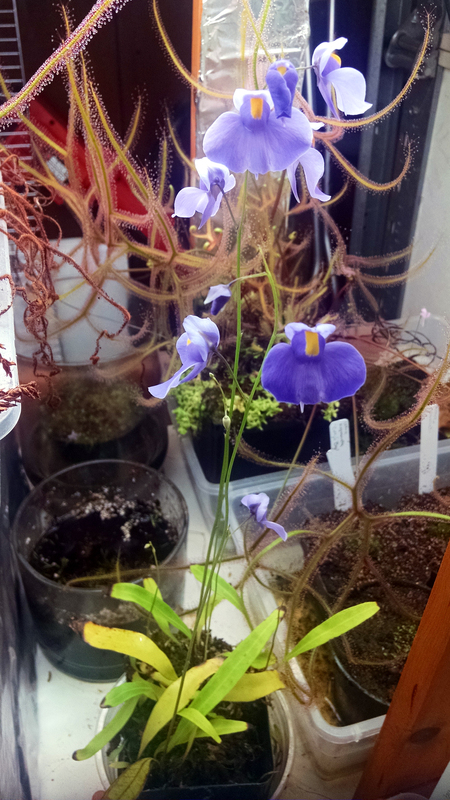 Finally, it's not an outdoor plant, but I have to show off my Utricularia longifolia again. I have a crush on U. longifolia. It's currently got 7 open flowers, and another due to open tomorrow or the day after. The oldest flower has been open for 3 weeks! It's survived me carrying the plant through a sort of windy rainy day to show off to some friends. This is definitely an orchid-like bloom cycle right here. I'm so stoked on it!